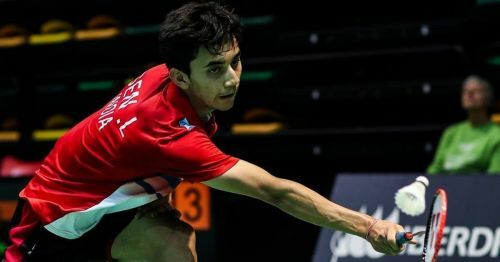 Rising shuttler Lakshya Sen won a thrilling semi-final to enter the boys’ singles final at the Youth Olympics 2018 in Buenos Aires, Argentina on Thursday. The 17-year-old, who is seeded fourth at this tournament, saved a match point to edge the second seed Kodai Naraoka of Japan, 14-21, 21-15, 24-22 in 1 hour 15 minutes. With his entry into the final, India has been assured of its seventh medal from the third edition of the Youth Olympics. Till now, India has grabbed a couple of gold medals in shooting, with a third one coming from weightlifting. Three silvers have been added to India’s medal tally through shooting and judo. India’s best result from this sport so far has been HS Prannoy’s silver medal win in 2010, and Sen will be hoping to go one better this time. Considering Sen had never beaten the Japanese in two career meetings, he was the underdog coming into this match. And it began in that fashion with Naraoka looking the early aggressor as Sen struggled to cut down on his unforced errors. The reigning Asian junior champion regrouped brilliantly in the second game as he stormed out of the blocks and raced ahead to an 11-1 lead. However, he was unable to stretch the gap between them any further as Kodai made a strong comeback, aided with a few errors from the Indian. The Japanese shuttler closed down the difference to just six points before Sen could wrap up the game and force a decider. The decider had incredible momentum shifts as both players alternated between the magnificent and the mundane. Sen was the first one to stamp his authority and he built an 11-0 advantage, which did not look safe after Naraoka won six points in a row. Again it was the Prakash Padukone Badminton Academy product, who seized control and went ahead to 18-8 only to see a determined Naraoka wiping out his huge lead and drawing level at 19-19. Sen then failed to convert his two match points and Naraoka too remained unsuccessful in converting his solitary match point before the Indian finally made the last push to close the match out. Lakshya will now take on the fifth seed Shifeng Li of China in the gold medal match on Friday.